SEOUL, Oct. 12 (Yonhap) — H-Line Shipping Co., a midsized South Korean shipping company, has placed an order worth about US$142 million for two bulkers with Hyundai Samho Heavy Industries Co., the oceans ministry said Friday. The 180,000-ton vessels — powered by liquefied natural gas (LNG) — will be used on a route between South Korea and Australia starting from 2021, the Ministry of Oceans and Fisheries said. The bulk carriers will be the first LNG ships in South Korea to sail on a foreign shipping route, the ministry said. The government is providing funding worth 9.6 billion won for the project to help develop the emerging marine transport sector comply with the International Maritime Organization’s sulfur cap on bunkers, set to be enforced in 2020. LNG-powered ships are considered an eco-friendly option to meet strengthened regulations, but high costs have posed challenges to private shippers. South Korean shipyards have outstanding expertise in building LNG carriers and bunkering shuttles, but they are still in the early stages when it comes to LNG-powered ships and related bunkering infrastructure. 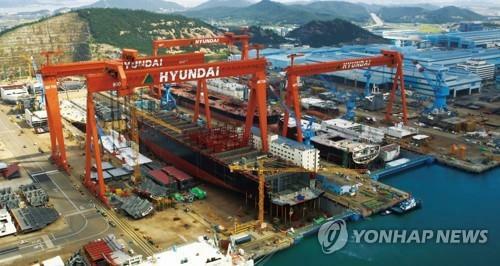 Hyundai Heavy Industries Co., the world’s largest shipbuilder by sales, owns 80.54 percent of Hyundai Samho Heavy.